I've never really been good at making tempura, the quintessential Japanese deep fried dish. My mother's tempura has always been terrific - crispy, light, and not greasy at all. So, taking advantage of her extended vacation here this year, I drilled her properly on how she makes tempura. Her method does not rely on special tempura flour (cheap in Japan but expensive or hard to get a hold of elsewhere), or other recently touted additions like vodka or other high-alcohol liquor, so anyone should be able to do it. Just follow the key points listed below. The light tempura batter is meant to enhance the flavors of the vegetables or shrimp or squid and so on that is being fried, not mask it. So the fresher your ingredients are, the better your tempura will be. The flour in tempura batter is just there to hold the other ingredients together. It should not be allowed to develop gluten, which leads to heavy, doughy batter. Therefore, you should always use ice cold water with ice cubes in it for the batter, and not mix it too much. A few ice cubes and lumps of flour floating in the batter are fine - they won't stick to the food you're dipping in the batter anyway. You should keep the frying oil at a constant high temperature. If you put too much in at once, you will lower the temperature, which can make the tempura soggy and oil-logged. There's not need to keep flipping over your tempura over and over. This just lowers the surface temperature unnecessarily. Let the hot oil do its work! Just flip over once if needed. Point no. 7: Drain the oil very well. With these points in mind, here is my mother's tempura recipe. Use whatever seasonal vegetables you have. These are what we had in late June in southern France. See the end for some other vegetable suggestions. Cut the sweet potato into rounds with the skin on. Take the blossom end off the eggplants, and slice into wide strips lengthwise. (If you have a fat Western style eggplant, cut into rounds as with the sweet potato.) Leave the baby zucchini whole, just cutting off the blossom ends; cut regular zucchini into wide strips. Leave the shiso leaves whole. Cut the carrot into matchsticks. Leave the green beans whole, just cutting off the tops and tails. Spread out the cut vegetables into a single layer on kitchen or paper towels, and leave to dry out on the surface for at least half an hour. The uncut baby vegetables and so on should not need to be dried, but should be totally dry on the surface. Just before you are ready to start frying, mix up the batter. If your egg is a 'small' size, use 250 ml of ice water (or 5 times the amount of egg). If you have a 'large' egg you'll need a tad more water. Mix the egg and water together, then add the flours, mixing rapidly with chopsticks or a fork. Do not try to get rid of all lumps, and floating ice cubes are fine - they'll help to keep the batter cool. Heat up the oil. You can use a thermometer if you like, in which case you should heat up the oil to about 175°C or 350°F. Otherwise you can see if the oil is hot enough by dropping a bit of batter in the oil. If the batter blobs drop down and them come shooting up to the surface immediately, the oil is hot enough. Make ready a large plate or tray lined with newspapers covered with kitchen towels, or a draining rack. 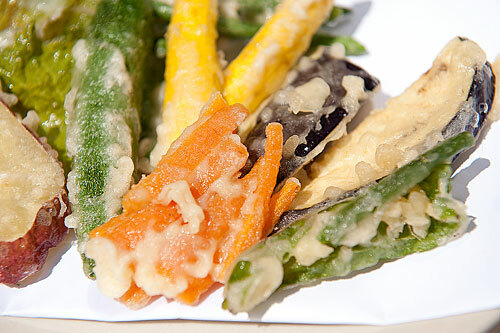 Larger pieces or whole vegetables should be dipped in the batter individually; smaller pieces like the matchstick carrots or the green beans are usually fried in little bundles, dipped in the batter and then into the oil with chopsticks. Start with the more delicate vegetables first, such as the shiso leaves, which only take a few seconds. Proceed to the harder vegetables, ending up with things like the sweet potato slices. Don't overcrowd the oil pot - be patient, and only do 3 to 4 pieces at at time! The amount of time each thing should be cooked depends on the vegetable. As mentioned, very delicate thin things only need a few seconds, while hard vegetables need a few minutes. You'll learn how long things need to be fried by experience, but if you're not sure just take a piece and cut or bite into it. Drain each piece on the prepared draining plate or try. Don't stack the pieces on top of each other, or the pieces underneath will just soak up the oil from above! Serve tempura when it's piping hot, for maximum crispiness. Tempura is often served on a piece of absorbent paper called a kaishi (懐紙), folded attractively. You can use a piece of plain, unprinted paper with absorbent qualities, such as untreated drawing paper (which is what I used in the photo above), plain white paper napkins, and so on. Otherwise, just arrange it attractively on a plate. 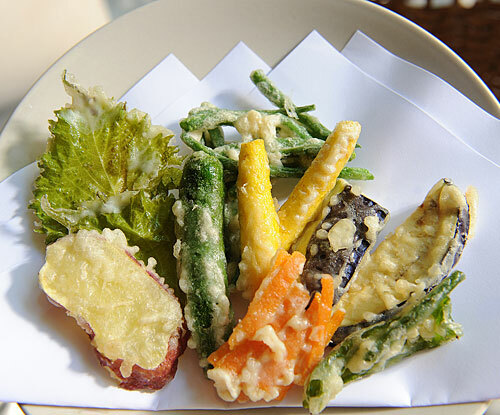 For vegetable tempura, my favorite condiment is just some sea salt, sprinkled on. You could add a few drops of lemon juice too, though this isn't traditional. You can also use tentsuyu, which is just a slightly thinned out version of soba tsuyu or soba dipping sauce (thin out with a bit of dashi stock). Grated daikon radish is often added to tentsuyu. Leftover tempura can be crisped up in a toaster oven or regular oven. Just spread out in a single layer and bake for about 5 to 10 minutes until it's a slightly darker shade of brown. Japanese people love soggy-on-purpose tempura too, especially in the form of tendon, which is just tempura on top of rice with some mentsuyu poured over it in its simplest form. Tendon is best made with freshly fried tempura, but you can use leftover tempura too. What vegetables can you use for tempura? Submitted by maki on 2009-07-08 09:24. The result was still good, but not great. my mother used to always tell me, ice ice COLD batter is the key. Wow, this vegetable tempura looks very delicious. Oh, yum. I just ate, but I'm craving some tempura now. I don't think I've ever had tomato prepared this way, but that sounds tasty. If you're feeling indulgent, and this is definitely not a traditional recipe, one of my favorite foods ever is green asparagus and cream cheese tempura. ETA: And broccoli! Broccoli tempura is delicious. The top bud-like-bits just sort of melt in your mouth. So good! Mmmm, your tempura looks delicious!! YAY! I've been trying to find a good, detailed tempura recipe (and lamenting the lack of one here) so this is fantastic! Thank you! Really love tempura. I will try yours recipe. Incidentally, in the US "rapeseed oil" (unfortunate name) is usually called canola oil. It comes from the seeds of mature turnips (Latin, rapa). Canola oil doesn't come from turnip seeds. Canola is it's own species of plant that doesn't have a tuber-like root base. Other than that I can't wait to make some tempura! The best I had was lotus root at a restaurant one time, but I've never had it since. I like your suggestion of using a Le Creuset pot! I have never tried to make tempura before because I lack a deep fryer and have no room for one anyway. Can you reuse the oil if you strained and refrigerated it? FYI for your North American audience--rapeseed oil is more commonly known as "canola oil" over here. Unfortunately most of it is GMO so best to use the organic kind. 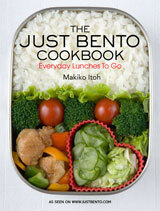 Great recipe, Maki, and excellent photography. Have you ever tried to make a gluten-free batter? I'd be keen to hear about your results, even if it's just "don't do what I've tried, it didn't work..."
I love tempura, my mom will always make it for me when I come home, though I suppose as an American I have too much of a fondness for fried foods. However, my mom always rolled her tempura in panko before frying it, which is actually how I prefer it. I like the extra crunch it gives. Wow, Thanks for such a comprehensive post. I should be able to master a perfect tempura next time. Yummy! I have two questions: with fava beans, do you know if one should shell the beans and also peel off the thin outer membrane as one does for Italian & French fava bean recipes? And secondly, could one make a sauce of your Japanese essence thinned out with dashi? Mmmm, looks delicious. One thing puzzles me, though. How much oil is needed for frying? I usually avoid deep fried dishes because I always end up throwing away so much oil. I've been making tempura for many, many years. I've done the ice water... everything. I've even lived and traveled in Japan. But I've NEVER gotten it quite right. However, your detailed description is so wonderful that I can't wait to try it! I hope that my shiso turns out well because it's one of my favorites. Thank you so much Maki! Great recipe - thanks for keeping it simple, it's great when people go back to the basics of a good dish. I found you through the JB site. Love it! Went exploring tonight. Tempura has been on my must master list for a while. I even bought a deep fryer. I have room for it. But still no success. I hope to try your mother's tips, and my garden is overflowing with veggies, so now is the time. I will watch for the shallow deep-fry alternative too. That deep fryer is one scary machine! Thanks for the recipe, Vegetable Tempura is one of my favorite things to make! I have never tried to make my own batter though, I always buy the prepacked stuff. Another tip that I learned from my (Japanese) Mom is to wait for the last minute to add the flour to the batter. Make sure that you have the vegetables and other ingredients ready, and the oil almost hot (as it can take a while to warm up the oil), before you add the flour to the egg and water. I was working on my own recipes to translate into Thai, and I saw your section on "Not Very Traditional". I am Thai, but my husband loved some of the suggestions you had when I made them. I had that problem too, so I doubled the amount of flour I used, and that helped. I did this and ended up with a batter that was water thin and didn't hold onto the veggies. Even after I added more cornstarch and tried to get the veggies into it, I got more fried veggies lacking any tempura batter sticking on for the classic look. If the batter does not stick well, try dusting the vegetables lightly with flour before dunking in the batter. thanks for a great post. one question.. if you are cooking at home in a wok or a pot, will the oil spray a lot and make a huge mess? if so, are there any way to limit the amount of spitter spatter? It will spray a little but but not much, as long as you stick to vegetables. If you are frying something like squid, the trapped water in the squid may explode and cause a big splatter (and be dangerous if you're in the way). Make sure you never overfill your oil-frying pot or wok though. Thank you for posting this recipe. I made this for my two nieces, and they had never had Vegetable Tempura before. My own four kids either hadn't had it or didn't remember (shame on me for not making it more often!) It was a hit and I got to teach my niece some more cooking skills! Wow.... I just found your blog, and I am so excited! I love Japanese food and have wonderful memories of eating tempura on a rainy March afternoon in Tokyo with my best friend from high school. I'm gluten-free, though, and frying always intimidated me. After successfully making gf fried green tomatoes last night, though, I'm ready to tackle tempura. I'm wondering about the ice cold water. You mentioned something about maybe the ice cold water helps to inhibit the development of gluten in the batter? So, if I'm using a gluten-free flour mix, would I not need the water? Or does the ice cold water help to keep the batter light and crispy? This is probably something that I'll just have to experiment with and try myself, but I was wondering if you might have any insight. Thank you so much for the wonderful information on this site! could you please let me know if i can skip or substitute the egg as i am allergic to eggs . I tried this recipe today and wasn't altogether satisfied. I'm more than willing to believe I did something wrong, but the batter turned out much too thin. It did not adhere very well to the vegetables even after I tried dusting them with flour. I added additional tablespoonfuls of flour and cornstarch to the batter until I decided "to hell with it!" and stuck with my runny batter, as mouths needed to be fed. Looking at the pictures above, I can see the coating is meant to be quite thin, more so than I'm used to. I like a bit more crunch (which doesn't necessarily compromise lightness), so I will reduce the amount of water significantly next time to see what happens. I've also heard of preparations that call for drizzling additional batter over the cooking veg to bulk up the crust. Might want to give that a try as well. How large should the pieces be? A friend was thinking around 4 inches but that seems kind of large to me, I thought tempura needed to be small/thin in order to cook quickly so it wouldn't spend much time in the oil. Your friend is right in this case. About 4 inches long is a good size to aim for. This didn't work so well for me. The batter (250 mL of ice water, one small egg, 3 tbs. all-purpose flour & 1 tbs. cornstarch) was almost as runny as water. I mixed only very briefly, but the flour quickly settled at the bottom. It was basically like frying the vegetables without a batter because it didn't adhere at all. Any idea what I did wrong? I've noted several people having problems with this recipe. This does result in a very thin, crispy coating on the vegetables, not the thick one that is on tempura that you often see in restaurants, especially outside of Japan. I'll see about posting a thicker-batter tempura recipe soonish. If you are having trouble with the batter being too thin, try reducing the water (or in other words, adjusting the water-to-flour ratio). Do be sure to always use cold water though. I have not had Tempura before. I am sure that it is going to taste great because I could see it from the pictures that you have posted. I would love to try the method you have posted to make Tempura. Thanks for such a detailed recipe. Keep posting.